DENVER (AP) Nathan MacKinnon was given a day off from practice, which created a little stir on social media. Turns out, nothing to fear. The Colorado Avalanche just wanted to give their top scorer and Hart Trophy candidate a little rest Monday before embarking on the postseason. Not many gave this team much of a chance to make the playoffs at the beginning of the year. Understandably so considering they were coming off a 48-point season. But here the Avalanche are, about to face the top-seeded Predators in the first round beginning Thursday in Nashville. Colorado is rested, rejuvenated and carries a surge of momentum after needing to win its final game to secure its first postseason spot since 2013-14. The type of turnaround the team has made doesn’t happen that often in the NHL world. The last time it occurred over an 82-game season was when Pittsburgh also improved by 47 points from 2005-06 (58) to `06-07 (105). The turning point for coach Jared Bednar was in early December, when his squad wrapped up a 1-4 homestand. A similar thing happened a year earlier and it sent the team into an unrecoverable downward spiral. This time, it was different. 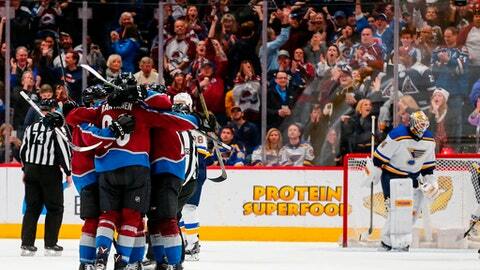 The Avs found some traction and at the end of the month began a streak of 10 straight wins. Still, they needed a 5-2 win over St. Louis in game No. 82, a winner-take-all affair, to secure their spot. For Bednar, it was one of his team’s best performances of the season. Colorado will be without two key players for this series – defenseman Erik Johnson and goaltender Semyon Varlamov, who are both sidelined by knee injuries. Not only that, but the team has struggled this season against the Predators, going 0-3-1 and being outscored by a 17-8 margin. ”It’s not going to be an easy series. But if you want to get farther, you have to beat the best team and we start with the best team,” goaltender Jonathan Bernier said. Avalanche players Colin Wilson, Gabriel Bourque and Samuel Girard all stepped up at a recent meeting and chatted about their ties with Nashville. They offered a little insight into the team they’re about to face. The Avalanche relish in the fact that just a year ago Nashville was the second wild-card team in the Western Conference and advanced all the way to the Stanley Cup final. They wouldn’t mind following that sort of path. Bednar was asked if he thought there might be concerns over his team being content to merely be in the playoffs.